"The poster is offensive," said the leader of the group Black Kids Swim. A Red Cross poster is being decried as racist nationwide, but it's not on display at public Baltimore city or county pools, officials say. The controversial swim safety poster is not hanging at pools run by the city's Department of Recreation & Parks, according to Spokeswoman Gwendolyn Chambers. The same goes for the two pools owned by Baltimore County and operated by the Y in Central Maryland, spokeswoman Sara Milstein said. Nor would the Y have displayed the posters if it had received them, she added, given their content. The illustration caused an outcry this past week due to what many see as racist undertones. 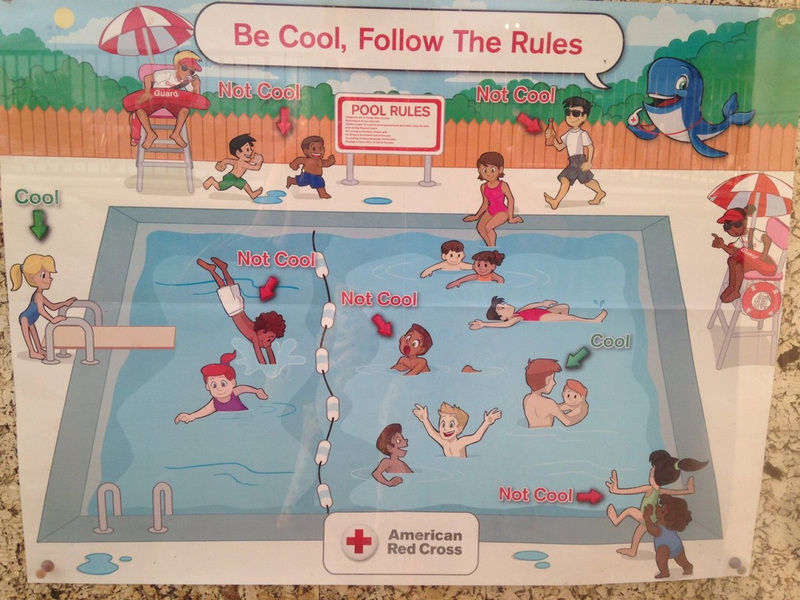 Under the heading "Be Cool, Follow the Rules," the poster offers do's and don'ts of pool behavior, advising against running, roughhousing, or diving headfirst into pools. Many of those misbehaving in the graphic are children of color, while the models of good behavior are white. The Red Cross issued an apology on its website Monday. "It was absolutely not our intent to offend anyone," it read. "As one of the nation's oldest and largest humanitarian organizations, we are committed to diversity and inclusion in all that we do, every day." The statement promised the removal of the poster from all "partner aquatic facilities." A spokeswoman for the Red Cross' regional branch did not respond to questions about whether the poster was hanging anywhere in Maryland. The poster is particularly offensive to some given what Ebony Rosemond described as a long history of African Americans being excluded from swim facilities and discouraged from swimming. Rosemond is the director of Black Kids Swim, a group based in Prince George's County. Public pools and beaches were commonly segregated throughout U.S. history, she said, which often forced African Americans to swim unsupervised or in dangerous ocean waters. This led to a disproportionate number of drownings among black swimmers, Rosemond said, creating a "legacy of fear" that continues to feed a wariness of the water among many African Americans today. About 70 percent of African-American children cannot swim, according to a 2010 study commissioned by the group USA Swimming. A 2014 study by the Centers for Disease Control and Prevention found that black children aged 5 to 19 were five and a half times more likely to drown in pools than their white counterparts. Rosemond, a Prince George's native, said she founded Black Kids Swim in 2015 to help African-American children reach competitive levels of swimming. The poster, she said, was only hurting such efforts. "It creates an unwelcoming environment in any pool or rec center where they are hanging," Rosemond said of the poster, which she called offensive. "We want them down," she said.